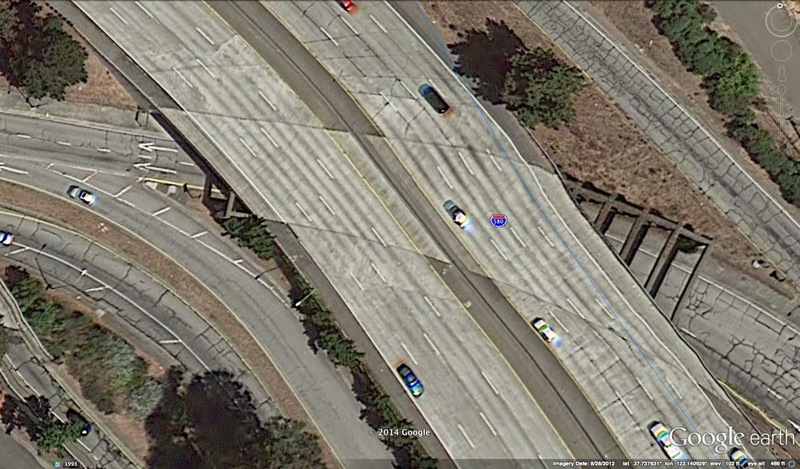 The Foothill Blvd Undercrossings (33 0335) are parallel (northbound and southbound) bridges that carry I-580 over Foothill Blvd. These bridges are on a high skew and so they have outrigger bents perpendicular to the road supporting the superstructure (see photo below). Even more interesting is how terribly cracked the pavement and even the concrete bridge superstructure is at this location. The ground must be slowly sliding or subsiding since the expressway was built in 1964 (These bridges carry over 140,000 vehicles a day). Alameda County, California Bridges: Foothill Blvd OC across Interstate 580 by Mark Yashinsky is licensed under a Creative Commons Attribution-NonCommercial-NoDerivatives 4.0 International License.